The Perfect 9-Stop InterRail Route For A Beach Baby! Break out the suntan lotion and your favorite pair of shades — you’re going to need them when you travel along Europe’s coast to the best beaches it has to offer. This interrail route is designed especially for your inner beached whale and is full of promising and sunny destinations that will help you erase some bad tan lines, or help you get tan lines if you don’t have them. Don’t even worry about whether you’re not “beach body” ready because, ‘beeach,’ we don’t care! Just don’t forget the extra strength tanning oil if you’re blessed with some fair skin that tends to sizzle faster than an egg under the Mediterranean sun. If you’re ready for the triple threat fun of surf, sand and sun, then we’ve got a route for you to tick them all of one by one. Get ready for the first stop on your eight-part beach adventure. Portugal’s southernmost coastal town, Faro is the perfect first place to start getting your tan on. Faro’s beaches offer beautiful landscape imagery from down below on its sandy banks. Many of the beaches, including Praia da Falésia, which offers views of its massive cliffs you can see the sites Faro has to offer without even leaving the comfort of your towel. The second stop in Portugal is just north-west of Faro and about a three to four hours by train from your first destination. Recently listed as Lonely Planet’s Best in Travel number one place to travel to in Portugal, Lisbon is an absolute must see. Lisbon has amazing medieval defence tower known as the Belém Tower, as well as a Moorish castle, São Jorge Castle and several cathedrals you have to see! After you’ve done some exploring of the cities most historical sites, you can visit the cities beaches which are a lot closer than some might suggest. One of the best beaches is the Costa da Caparica just further south of the city. It’s been highly recommended that you avoid Estoril/Cascais because they can be pretty touristy. One of the most renowned places on this interrail route for its beaches is San Sebastian. The cities feature one of the most famous urban beaches, Beach of La Concha. Due to the popularity of its beaches, you might want to hit a few of them up in the early morning to mid afternoon to avoid the large crowds. This will allow you to also tour some of San Sebastian’s beautiful city hall and artfully designed bridges. This little independent city-state sitting on the edge of France has a lot more offer than its size suggests. Monaco is filled with exotic gardens, museums and of course its gorgeous beaches. Though mostly man-made these beaches are perfect for soaking up the sun. 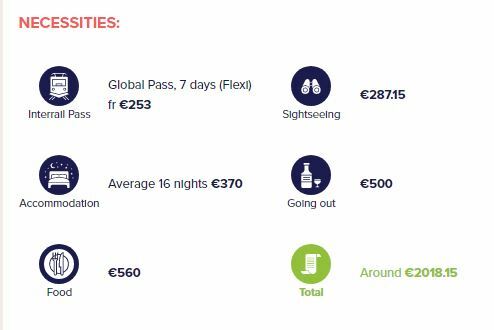 Monaco tends to be on the expensive side in terms of finding places to stay, so it may be best to pass through the city. If you do stop during the day, the city is easily navigable on foot and offers a free public beach to catch some rays of the sun. If you do decide to hop on a bus, try to take a route to Monaco’s F1 Track. Racers will love to look at the F1 track is a street circuit used for the Grand Prix held in May. For the rest of the year the circuit open to public transportation. This sprawling metropolis is located in Italy’s north region and the first stop on your three-part Italian adventure. Though Milan isn’t exactly located as conveniently to the beach as several other of your destinations, you can spend a day in the sun at Lake Como, about two hours or so outside of Milan’s region. If you don’t feel like making a day out of Lake Como, you can definitely enjoy some of Milan’s best food including its amazing sweet breakfast at Pavé. Later in the day, you can grab a slice of delicious pizza from Gino Sorbillo. When in Rome, avoid the cost of tours by acting as your own tour guide. Most of the city’s icons like the Colosseum are viewable on foot, so you don’t need to spend much on transportation either. However, you may need to catch a quick ride to the beaches that are about 30 to 40 minutes by train. Perfect for a travelling day, these beaches are perfect for every kind of beach day you are hoping to have. If you are looking for a clean and convenient beach to layout on, it’s highly recommended you check out Anzio beach. Your next Italian station is to the gorgeous Amalfi Coast in Italy! Depicted as “seductive and beautiful” by Lonely Planet, this coastal paradise is sure to lure any beach baby fanatic. Located in the Province of Salerno, the Amalfi Coast offers 50- kilometre stretch of coastline of a rugged landscape. If you’re up for one day of extreme sports you can head to the village of Positano for some epic cliff jumping and swimming inside of caves. Finally, we save the best for last, well in our opinion maybe. The capital of Greece, Athens is teeming with the best and most interesting historical sites about its famed past as a powerful empire and innovative civilization from ancient times. You can definitely hear the best stories from Ancient Greece and Greek mythology. Several particular points of interest include the Temple of Olympian Zeus and the Parthenon. Athen’s has several beaches the closest are just over 20 Km south. These include Vouliagmeni and Varkiza. 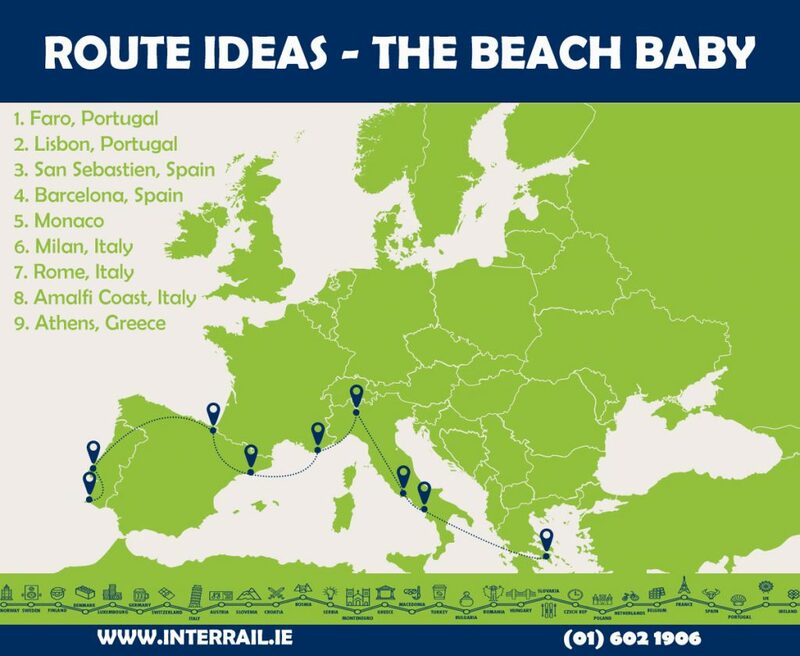 To find out more about this awesome beach getaway, including more information on planning your Interrail trip including route ideas, maps, pricing and more visit our website – www.interrail.ie. © 2018 USIT Ireland Ltd. All rights reserved.